Colour : White with Burberry London England written in navy. Made in Italy. Authentic Burberry Prorsum runway collection. Size S, in gorgeous dark navy colour. DO NOT miss this rare opportunity! This is an authentic Burberry t-shirt in excellent condition. White with iconic burberry checks and four buttons on the shoulders. In excellent condition. Clean with one small mark (1mm) around the neckline – hardly noticeable (see pictures for details). Size large Retail price is above 300. Condition 7/10 I can mail you the shirt for free! You are bidding on a Burberry Brit T-shirt. Fits Au 10-12 In good Pre-Owned condition. Sent with Australia Post Pre-Paid Parcel Post Satchel 500g. Please check out my other items- big cleanout! Happy bidding! Burberry Polo T-Shirt. Size Large (Regular fit). Local pickup is available from Albert Park. Burberry Cashmere/Wool/Silk White Mesh Detail Knitwear Size M44% Rayon /35% Cotton / 21% Virgin Wool Knitwear has a beautiful mesh detail on the top. This is a runway piece, that was retailed $1895Lots of great knitwear pieces on sale. Happy to combine postage. The polo is in good condition, buchetto (photo). Lunghezza 60 cm Lenght 23.6”. Spalla-Spalla 31 cm Shoulder-Shoulder 12.2". Italia: Per le. Colour: dark grey. Fit: stretch (very stretchy). Fastening: pull on. Fabric: polyester and cotton. Full length: 29 in / 74 cm. Pit to pit: 19 in / 48 cm. Waist: 19 in / 48 cm. Hem: 21 in / 53.5 cm. Sleeve Style Short Sleeve. Size Type Regular. Color White. Style Basic Tee. Unused item. Burberry's "Kids 160A size" T-shirt. color White Red Navy. but extraordinarily good mint condition. Stain but good quality goods. 6 Goods that can be used normally. We are not able to mark the item as 'gifts'. Unused item. Burberry's "M size" T shirt. Easy to match black color It is a simple V neck design. color black. 6 Goods that can be used normally. We are not able to mark the item as 'gifts'. P.O box correspondence. Color Greens. Style Graphic Tee. Size Type Regular. Shade Light Green. We have offices in the United States, Hong Kong and New Zealand. Material Cotton Blend. 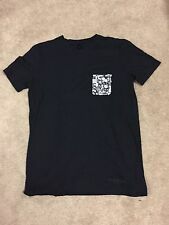 Burberry Brit T Shirt. Blue Check Print Scoop Short Sleeve Top. Burberry London. with Nova Check trim on shoulders. A stylish and versatile white short sleeve shirt from. Shoulder: 18". In very good condition, with a few small spots of discoloration. at the bottom (dirt and what may be blue ink), pointed out in. It is my privilege to serve and excite you in the best possible way. You are looking at a beautiful designer top made by Burberry. Scottsdale Clothing. Burberry black cotton T shirt with v shaped neck & Nova check piping along the sides In excellent condition Hardly Worn. Expertly constructed from cotton and boasting a print from the London Icons Collection, this T-shirt features a round neck, short sleeves and a straight hem. 100% Cotton. BEAUTIFUL GENTLY WORN BURBERRY BRIT CHECK SCOOP NECK TEE IN A BERRY COLOR. IT IS SUPER CUTE! Burberry London Blue Label. Nova Check plaid. A lovely short sleeve shirt from. It's a classic pink & slightly non-standard color. Length: 21". (17" once across). 100% Cotton. In excellent condition, shows minimal wear. BURBERRY BRIT Ladies Classic Polo Shirt Size XS Check Sleeve VGC in Red. Condition is Pre-owned. Shipped with USPS First Class Package. Womens BURBERRY White Cotton Polo T-Shirt/Top, Size M (on label L), Good cond. Fabric: 98% Cotton; 2% Elastane. Note: this is a used item; therefore despite our inspection process there may be minor imperfections. Underarm to underarm (unstretched): 17.5". Weight: 120g. Fabric: 80% Cotton, 15% Nylon, 5% Wool. Item is in very good previously loved condition. Faint wear throughout; minor discoloration at front. Length: 27.5". Great condition authentic Polo Shirt. XXS=00-0, XS=2-4, S=4-6, M=8-10, L=10-12, XL=14. Machine wash, line dry. Made in Portugal. - Opening any cases (item not as described or item not received). 95% cotton & 5% elastane. nova check print to collar. Burberry Brit Short Sleeve Woman Top/T-Shirt. Material: 90%Cotton, 10%Elastane. Color: Green. Length: 25 1/2". NEW WITH TAGS BURBERRY LADIES STYLISH T-SHIRT TOP. 100% AUTHENTICITY GUARANTEED. LUXURIOUS QUALITY SUPER SOFT AND STRETCHY T-SHIRT IN WHITE COLOR, RUFFLED LACE EMBROIDERED SLEEVES, BURBERRY LONDON ENGLAND SIGNATURE LETTERS EMBROIDERED ON THE BACK. CHECK DETAIL TRIP INSIDE THE COLLAR. 100% COTTON TOP, SLEEVES LACE EMBROIDERY 35% VISCOSE, 34% COTTON, 31% POLYAMMIDE. A top made from soft stretch cotton for a close fit. Machine wash. 93% cotton, 7% elastane. A soft cotton jersey T-shirt, updated with an overlaid logo print. Machine wash. 100% cotton. Burberry Long Sleeve Top Large. Condition is Pre-owned. Shipped with USPS First Class Package. 100% Authentic Burberry Brit Beige Nova Check Stretch Cotton T-Shirt - M / UK 10 / EU 38 / US 8. Pattern: Nova check. Colour: beige/grey/red/white. Fit: stretch. Fastening: pull on. Waist: 15 in / 38 cm. Beautiful burberry shirt. Save your money! Color: White. Button placket. Fold collar. Color: White. Doing that is against U.S. and international laws. Short sleeves. Pickup hours.